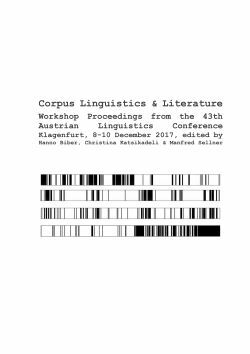 This volume of papers presents the core of the presentations given in the workshop “Corpus Linguistics and Literature” at the 43rd Austrian Linguistics Conference at the University of Klagenfurt over a cold and windy weekend in December 2017 (8th-10th). The linguists Christina Katsikadeli and Manfred B. Sellner together with the philologist Hanno Biber invited to this workshop in order to continue and at the same time to widen the spirit of and the active attention to “Corpus Linguistics” that had been initiated with the workshop organised by the ACDH members Claudia Resch, Wolfgang U. Dressler, and Karlheinz Mörth at the 40th Austrian Linguistics Conference at the University of Salzburg in 2013. As such, we wanted to grant the linguistic community of Austria and also international participants the opportunity to present their original work on corpus linguistics at the meeting in Klagenfurt. But differently from the pioneers of 2013, we decided to restrict the area of analysis to the specific genre of “literature”, while concurrently granting a wide interpretation of this genre of writing. The results of this initiative are the online publication of selected refereed papers in the e-pub series of the ACDH. They do show the diverging interests of the participating practitioners of literary corpora studies, as well as their specific use of corpus-linguistic data, depths of methods, as well as extent of tools. Thus, Adrien Barbaresi’s article deals with spatial patterns in a historical collection comparing the information given in texts from 1910 and 1920 making use of an original corpus tool. The “Aichinger Students’ Group”, that is Marlene Csillag, Matthias Müller, Andreas Dittrich, and Katharina Godler tried out their corpus linguistic expertise in an analysis of the representation of “space” concentrating on reference to places and events in Ilse Aichinger’s literary work. The linguist Wolfgang U. Dressler teamed up with the literary scholars Vanessa Hannesschäger and Barbara Tumfart to get into the specifics of neologisms as elements and proof of poetic creativity by contrasting them in Johann Nepomuk Nestroy’s and Peter Handke’s literary works. While the previous contributors to this volume used German as the language of analysis, Eleni Karantzola and Konstantinos Sampanis analysed the function and distribution of aspects of complementation in an early modern Greek corpus. In this they also provide arguments to the effect that this type of information can only be deduced from a large corpus of relevant data. Latin is represented in the article by Robert Knapp. Using corpora of “artistic prose” as well as literary language, the author discusses the possibilities to extract the information on the quantity of syllables with a program written in Java that is to extract the desired information automatically. Oswald Panagl and Christina Katsikadeli enter new territory in searching for “universal features” of the genre “parody” by analysing Johann N. Nestroy’s parodies of R. Wagner’s works “Tannhäuser” and “Lohengrin”. Finally, Manfred B. Sellner draws attention to the vocabulary of Thomas Bernhard’s autobiographic novel with respect to the concept of “lexical richness”.